The Brazoria Historical Militia and the Texas Navy will be on site beginning at 9:00 am. A number of other activities will occur after the groundbreaking. The Brazoria Historical Militia and the Texas navy will provide backup and cannon fire. The museum (upstairs in City Hall) will be open from 10:40 am until 1:00 pm. SOBA (Save Our Beach Association) will be distributing information and selling t-shirts. The Surfside Beach Lions Club will have a booth for their beautiful cookbooks as well as membership information and order forms for the commemorative pavers they are selling. 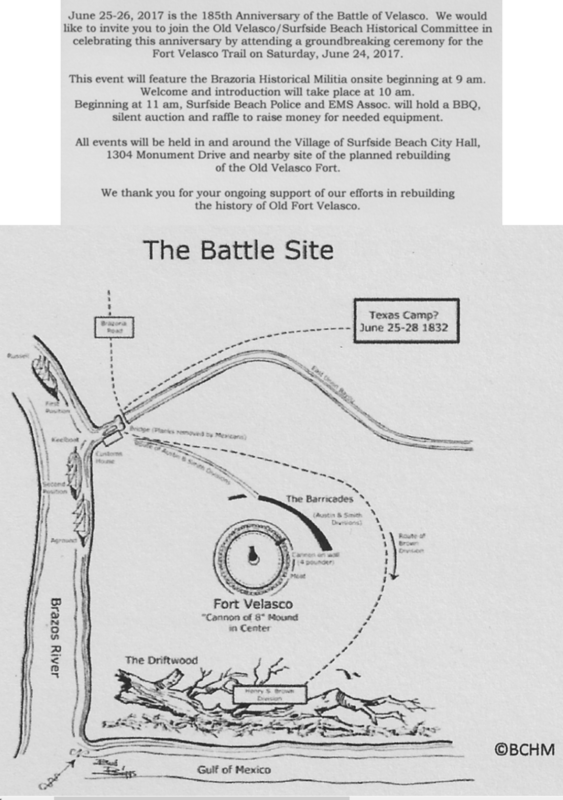 The Fort Velasco/Surfside Beach Historical Committee will be giving away Fort Velasco fans and copies of the Texas Gazette (July, 1832) and selling Fort Velasco t-shirts and books about the Fort Velasco period in Texas history.